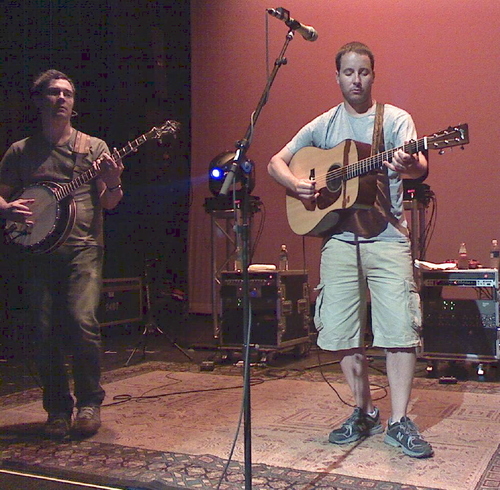 7/19: Yonder Mountain String Band @ Ridgefield Playhouse, Ct. 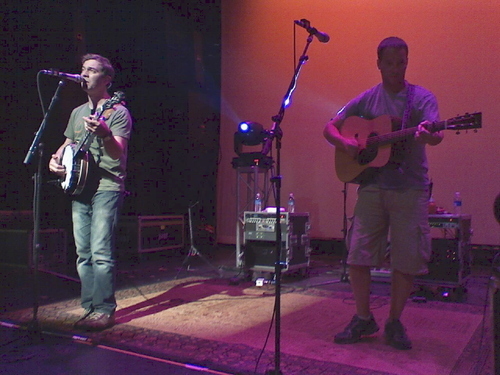 Bust out your bandanas and pigtails…Yonder Mountain String Band is in town! “If you guys stay seated the whole time, I’m gonna be really freaked out.” It’s not often you hear a front man with a mandolin give an audience that warning. 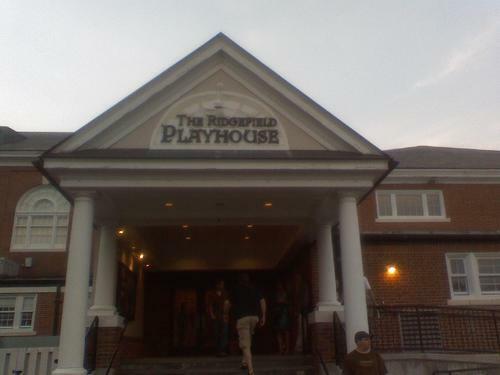 But with that, the intimate Ridgefield Playhouse turned into an old country hootenanny faster than a cowboy draws his gun. Talk about freaked out! Before I knew it, the 500+ hippies around me rushed the stage and were stompin’ their feet so hard that the floor beneath me was shaking. As the smell of patchouli filled the room, dreadlocks bopped up and down and an inflatable whale soared across the crowd, it was clear this was no ordinary hoe-down. 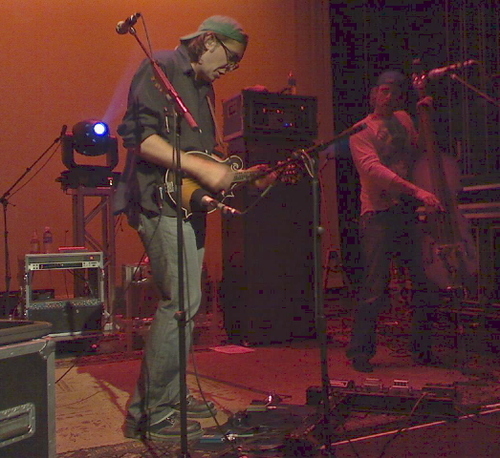 Determined to get their quick-stepping freeform dance groove on, despite the limited space, the energetic Connecticut crowd was proof of how fast this progressive bluegrass string band from Colorado is taking over the jam band community. 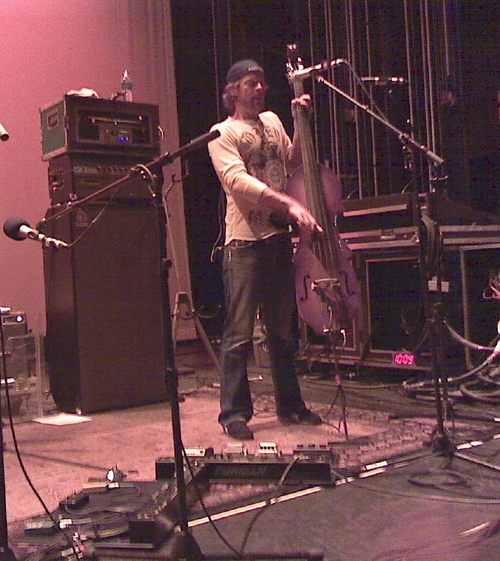 Yonder Mountain is in a class of its own… folk meets hard rock meets Grateful Dead, if you will. You’re not likely to hear them on the radio, but hit any summer festival and they’re bound to be on the roster. They’re a touring band that truly comes to life on stage through improv, dueling solos and awesome jam sessions. Lead singer and mandolinist Jeff Austin looks like he’s living out a rock n’ roll fantasy on the more fast-paced songs, curling up his top lip as if he’s playing the piercing sounds of an electric guitar. At the same time, guitarist Adam Aijala looks so comfortable and relaxed strumming away on his acoustic strings that we thought he might take a nap mid set. Throw in Dave Johnston pluckin’ on the banjo and hottie Ben Kaufmann on the upright base (I’m talking serious Brad Pitt look-a-like), and somehow this atypical, all string quartet works—closing the gap between old school bluegrass and good ole’ rock, and breaking the stereotypes of how banjos and such can be played. I have seen these guys and they are awesome! Great to watch as well as listen to! Leslie, you seriously missed your true calling as a music critic! Every band you write about, you make me want to go get their CD as soon as possible! Never even heard of this group, but they sound awesome.Thanks for the review. Like your style,don't change a thing. YMSB is a band I have always wanted to see, maybe I can catch them on the west coast sometime. Thanks for the write up. Great review...caught them last summer and this made me relive it all over again. Thanks for sharing Leslie! I havn't heard a lot of string bands lately, not being in New England any more, but I would look forward to seeing this band live. Your writing really brought the performance to life-thanks! Once again you amaze me with your critique. Normally, I would have no interest in a band like this BUT, you seem to know how to say just enough to make me want to check them out. Great pics! Sounds like fun! Great Review and Great Pics! Um, can you find out if Ben is single??? Keep up with the fantastic posting - I feel like I am at the shows with you. Nice! I love these guys. I didn't even know they were in town. I am so jealous. Do you know if they are still on the east coast? I don't know how I missed you at the concert. You did a great job capturing the night. Rock on! Barefooted friend in the bathroom? Lol. Sounds like another great concert! Wow! Sounds like you had a great time! 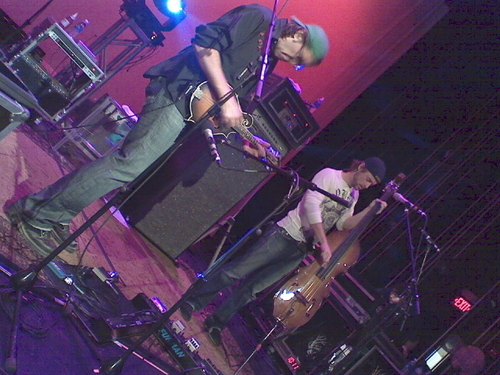 I'd love to catch Yonder Mountain in concert. Thanks for the great review and pictures. Wow!! Sounds like this one was a lot of fun!! Love your recap...feels like I was there. Because you liked them so much I say we go to the Telluride Bluegrass Festival next year. I've caught them a couple of times in the Midwest, a good show. Wow! Leslie, your review sure brought the show right here to me! Wish I had seen & heard this great band myself! HOLY BEN KAUFMANN! I am so not a barefoot concert-goer but for that guy i just may be! :-) Another STELLAR review, Les! Great photos! You are definitely keeping busy this summer. Thanks for the review. it's like spac all over again! Great review Leslie! I love me some patchouli!!! Sounds like a great time!!! Bluegrass can be lots of fun!